cameraName:; The name of the saved point of view (if relevant). 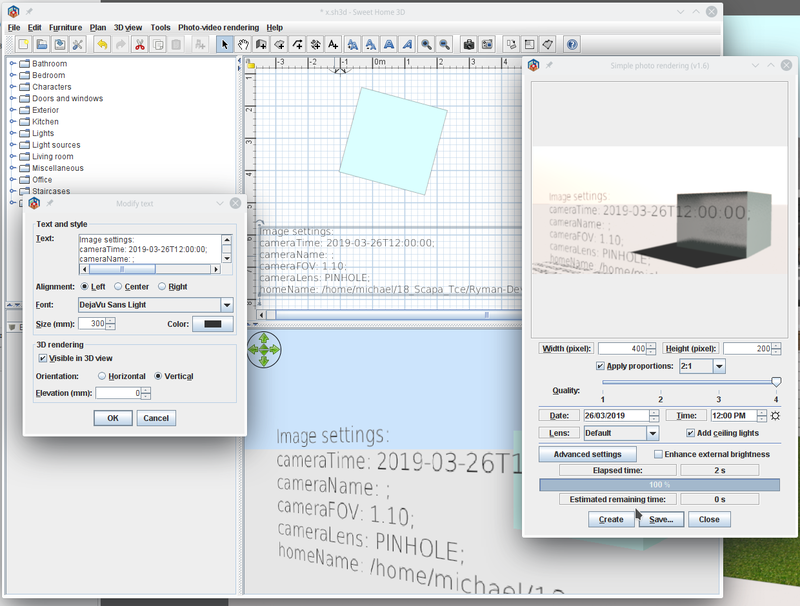 cameraTime:; The date and time set in the renderer panel. cameraFOV:; The camera field of view. houseName:; The house last saved filename. The idea is to allow the plan and renderings to be annotated with some identifying parameters. I have on occasion needed to evaluate sun-angles by generating renderings for quite few different times of the year. It would be quite useful to embed the date-time into the images. Hence this plugin. To activate meta text processing you must select the Meta Text menu item in the tools menu. Once this is done, any new or existing Text items will be monitored for meta-tags.